Editor’s note: This story is courtesy of Sam Houston State and Colgate athletics. HUNTSVILLE, TX. — Quarterback Jeremiah Briscoe passed for 358 yards and four touchdowns and running back Corey Avery rushed 25 times for 197 yards and a score to lead Sam Houston to a 48-21 victory over Colgate in the NCAA Division I Football Championship quarterfinals Saturday at Elliott T. Bowers Stadium. The Bearkats (11-3) advance to the FCS playoff semifinals next weekend. Sam Houston will face No. 1 seed Jacksonville State in Jacksonville, Ala. The Bearkats defeated the Gamecocks in the second round of the playoffs last year. Sam Houston, which like Colgate was unseeded, is making its fourth semifinal appearance in five consecutive FCS playoff trips. 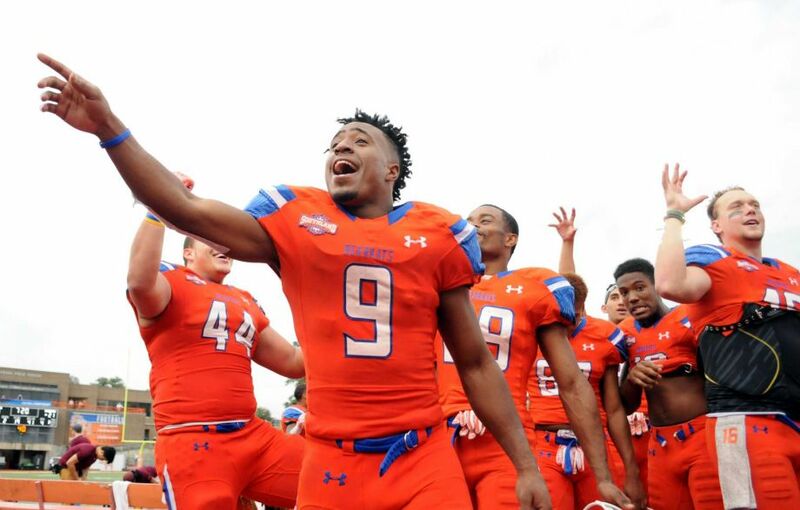 The playoff victory Saturday moved Sam Houston into a tied for 10th place for most NCAA Division I Football Championship playoff victories with 16. Briscoe, a sophomore transfer from UAB who has come off the bench to lead Sam Houston to playoff victories the past two weeks against Southern Utah, started Saturday and directed the offense to a school record 37 first downs and 653 total yards, third highest total in school history. Avery’s 197 yards rushing tied his career best set against Northwestern State earlier this year. The sophomore averaged 7.9 yards per carry with a long gain of 30 yards. Avery’s performance marked the eighth consecutive game a Bearkat running back has rushed for 100 or more yards. Briscoe’s touchdown passes were for 26 yards to Davion Davis, eight-yards to Yedidiah Louis, 18 yards to LaDarius Brown and 32 yards to Gerald Thomas. Louis led the Bearkats with nine catches for 119 yards including a long gain of 40 yards. Brown added eight catches for 86 yards. Brown also caught a 25-yard scoring pass from running back Jalen Overstreet. One week after limiting the nation’s top-ranked offense at James Madison to just 298 yards, Colgate couldn’t slow the new No. 1-ranked offense in Sam Houston State. The Bearkats racked up 270 yards rushing. The Raiders, who had gotten off to quick starts in playoff wins over New Hampshire and James Madison, trailed 14-0 after the first quarter. Despite cutting the edge in half early in the second period, the Bearkats maintained at least a two-touchdown advantage throughout the remainder of the game. Demetrius Russell led Colgate (9-4) with 15 carries for 77 yards on the ground while quarterback Jake Melville completed 12 of 25 passes for 142 yards and a score. Melville also ran for a 13-yard touchdown. All-America defensive end P. J. Hall had another dominating defensive performance for SHSU with five solo tackles, a quarterback sack, two pass break-ups and a blocked punt. The second-best postseason run in Colgate football history came to an end when the Raiders couldn’t slow down the Bearkat offense. Colgate’s season ends, but not before the Raiders bagged a Patriot League title and multiple playoff victories for just the second time in program and league history. Colgate’s seven-game winning streak ended against a team that is making its fifth straight playoff appearance and advancing to the national semifinals for the fourth time since 2011. The Raiders won two playoff games, their first postseason victories since advancing to the national title game in 2003 before losing 40-0 to Delaware. Colgate finished with 185 on the ground and 142 passing for a total of 327 on the day. Jake Melville, James Holland and Alex Greenawalt all registered touchdowns in the contest to lead the Raiders.